Discovered in 1976 by the Australian Astronomical Observatory, CG4 (Cometary Nebula 4) is a dark nebula located 1300 light-years away in the constellation Puppis. 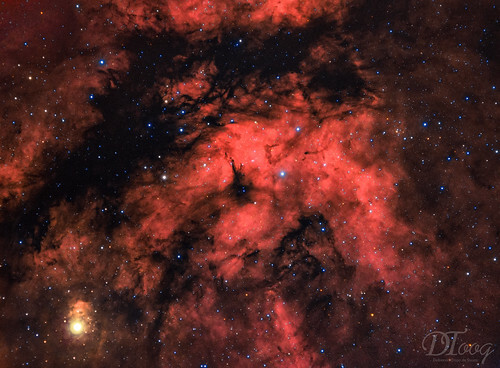 It is part of a group of dark nebulae with a cometary aspect, located around the Gum Nebula, all of them pointing away from the Vela supernova remnant, in the center of the Gum nebula. Some astronomers consider that these Bok globules, originally spherical in shape, have been deformed by the shock wave of the supernova. 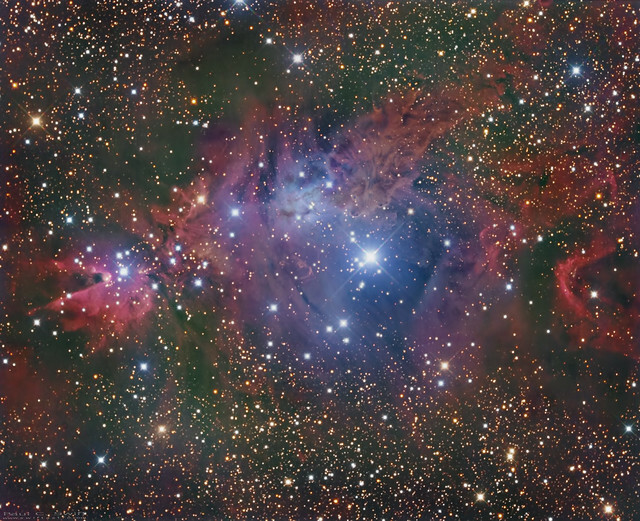 The "head" of the nebula is illuminated by the young stars born in its center and visible in this image. The nebula extends 8 light-years long, 1.5 light-years in diameter. Some call this nebula "the hand of God", but personally I see there rather an immense sandworm of Arrakis, aka "Dune", leaping to swallow the small galaxy! The galaxy in question, PGC 21338, is actually more than 100 million LY away. The galaxy at the bottom of the image, NGC2427, is 45 million LY away. Pákozd village was the location of one of the most important battle in the Hungarian Revolution of 1848, fought on 29th September 1848. The greatest part of the Hungarian victory was contributed by the Hussars. Hussars were members of a class of light cavalry, originating in Hungary in the 15th century. 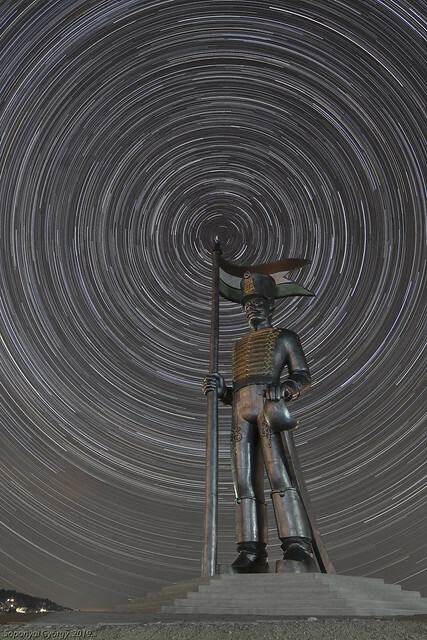 This 12.5 meter tall statue erected near the battlefield holds memories of these soldiers. This data was taken back in 2012 from Animas, New Mexico using my old 14.5 RCOS telescope. I processed the data back then but decided to re-process it 6+years later. It's hard to believe it's the same data! Boy how much we learn over the years. A HOO version of my previous picture. Only 4 hours of Ha OIII. Last edited by bystander on Mon Jan 07, 2019 4:06 pm, edited 1 time in total. Last edited by bystander on Wed Jan 09, 2019 5:30 am, edited 1 time in total. Reason: Please no hotlinks to images > 500Kb. Last edited by bystander on Fri Jan 11, 2019 3:05 pm, edited 1 time in total. Of course, I know that you are a great photographer, so I should not be surprised. 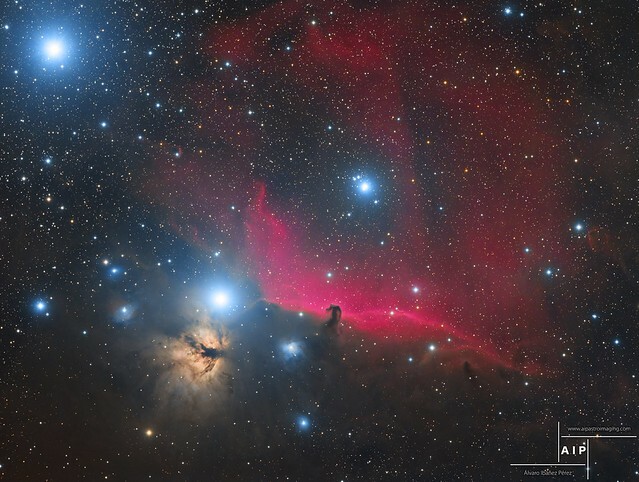 HorseHead Nebula, Flame Nebula, Alnitak and Alnilam. 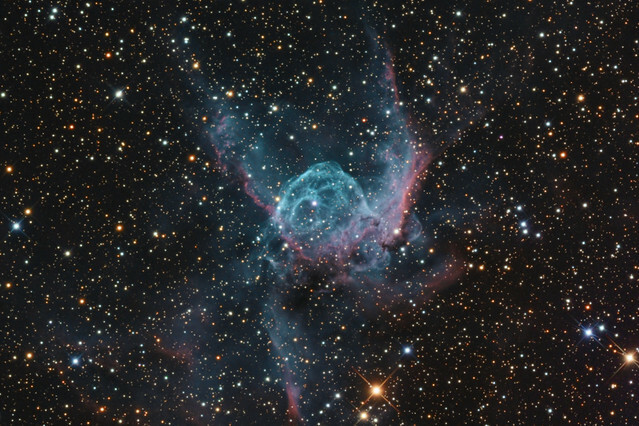 Thor’s Helmet is a popular target for astrophotographers. 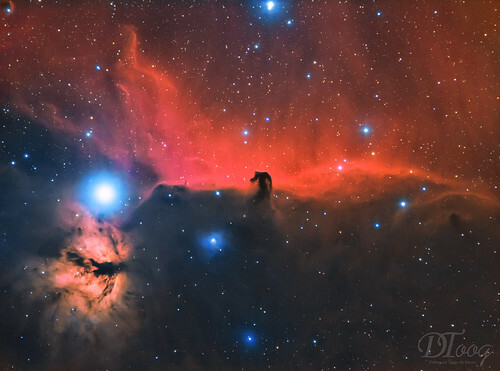 We all love to find shapes, and this cosmic cloud certainly ticks many boxes with the wing like appendages on the helmet, to the spooky eyes looking back from some 12000 light years away. The object spans about 30 light years across, and is believed to be in a brief pre-supernova stage of evolution. 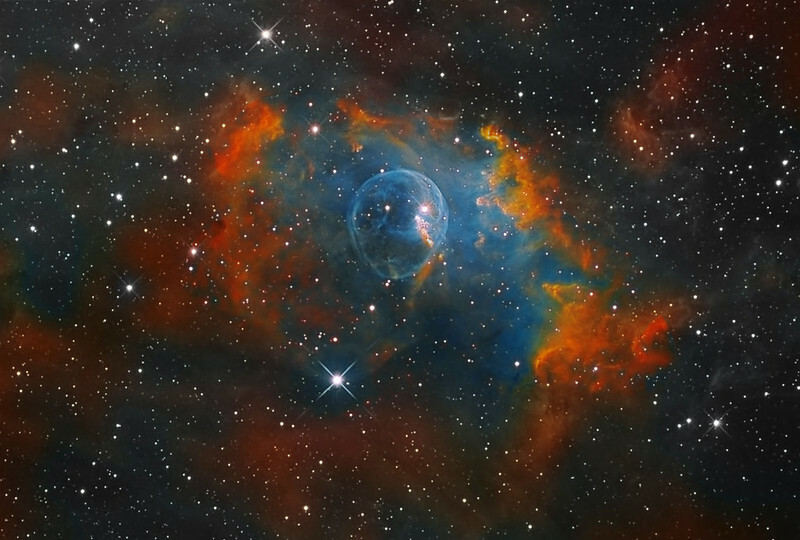 At its centre, an extremely hot Wolf-Rayet star is located, WR7. 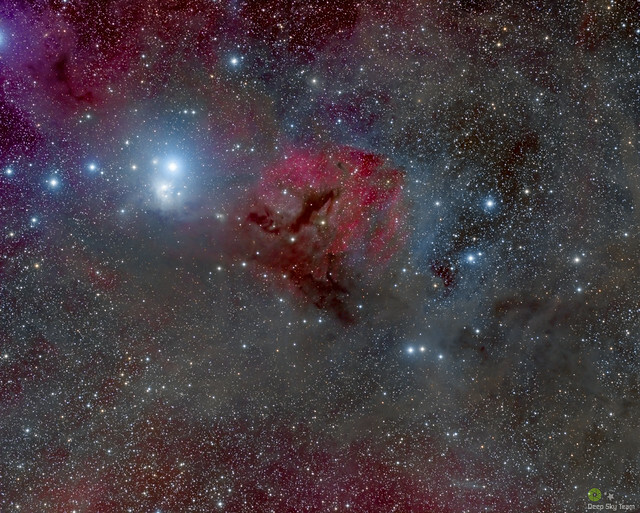 This incredible looking stellar object is located in the constellation Canis Major. I think the object resembles a spooky alien protecting his collection of shiny stellar marbles. "Floating in the serenity of the universe like a cosmic ammonite shell, NGC 2655 is an impressive example of a lenticular galaxy. Located 60 million light years away towards the constellation of Camelopardalis, its series of outer shell structures and faint tidal loops are nicely complemented by internal dust lanes near its core. Its panoply of morphological kinematics are indicative of a merger between two galaxies in the past, an intergalactic event that is now known to be a common feature of the evolution of galaxies. Other signatures of a past merger that aren't apparent to the eye are vast clouds of neutral hydrogen surrounding the galaxy that were uncovered in observations made using radio telescopes by professional astronomers. The unusual appearance of NGC 2655 brought it to the attention of the famous astronomer Halton Arp who added it to his atlas of peculiar galaxies under Arp 225. Another distinction is that the core is very luminous, which means that NGC 2655 belongs to the category of active galaxies known as Seyfert galaxies, which were named after the astronomer Karl Seyfert. The luminosity of Seyfert galaxies is thought to derive from a transfer of matter onto an accretion disk around a supermassive black hole. NGC 2655 is the brightest member of a small group of galaxies that also includes NGC 2715 (not visible in image). The diameter of NGC 2655 is approximately 200,000 light years but the envelope of neutral hydrogen gas discovered in the 1980's is about 500,000 light years." The starburst galaxy NGC 2782 lies about 110 million light years away toward the Lynx constellation. This shows the result when two galaxies of unequal mass collided about 200 million years ago. Their gravitational pull ripped out two tails of debris with very different properties. The optically bright eastern tail has some neutral hydrogen gas and molecular gas at the base of the tail, and an optically bright, but gas-poor concentration at the end of the tail. The optically faint western tail is rich in neutral hydrogen gas, but has no molecular gas, yet astronomers have recently found blue star clusters younger than 100 million years along both tails, indicating that those stars formed within both tails after the galaxy collision occurred. Current star-formation theory suggests that star clusters are formed from the collapse of giant molecular gas clouds, but if this were the case, astronomers would expect to see remnants of the molecular gas which helped give birth to the stars in both of the tails of NGC 2782. 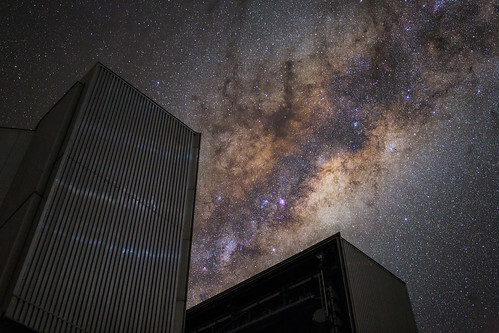 Finding unexpected young star clusters in the western tail could help explain why stars form in other places where there is little molecular gas, like the outer edges of the Milky Way galaxy or in the debris of other galaxy collisions. Thank you, Mark, this is one of my favorite weird galaxies! Thanks for the beautiful picture and the fascinating information! "QSO 0957+561 A (SBS 0957+561 A) and QSO 0957+561 B (SBS 0957+561 B) are the two components of a double-imaged quasar, meaning that an intervening mass concentration between Earth and the quasar bends light so that two images of the quasar appear in the sky. This is known as gravitational lensing, and is a consequence of Einsteinian warped space-time. The quasar lies at redshift z = 1.41 (8.7 billion ly), while the lensing galaxy lies at redshift z = 0.355 (3.7 billion ly). The lensing galaxy with apparent dimension of 0.42×0.22 arcminutes lies almost in line with the B image, lying 1 arcsecond off. The quasar lies 10 arcminutes north of NGC 3079, in the constellation Ursa Major. 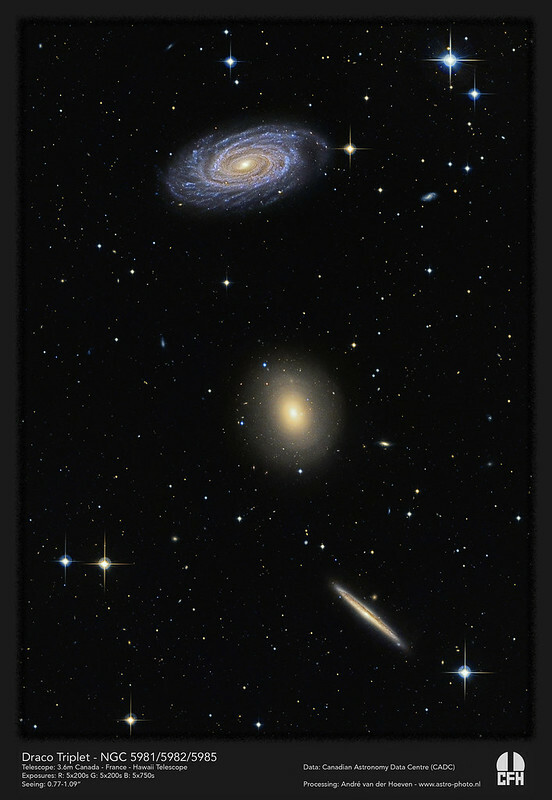 The astronomical data services SIMBAD and NASA/IPAC Extragalactic Database (NED) list several other names for this system. The Twin Quasar's two images are separated by 6 arcseconds. Both images have an apparent magnitude of 17, with the A component having 16.7 and the B component having 16.5. There is a 417 ± 3 day time lag between the two images." 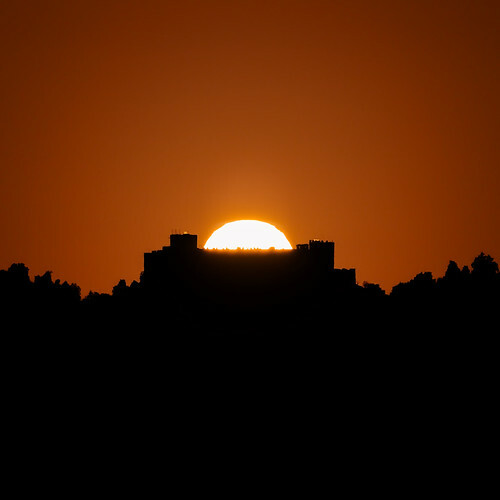 This image was taken through Narrow band filter Hα and O3. Four images which was taken with 380mm Refractor and KAF50100 cooled CCD shows detailed mosaic image.